Limestone cliffs meet emerald green waters and welcome you to a visual experience unique to only the shores of Southern Thailand. None of the 5 senses will get left behind on this adventure. The magic engulfs you and you are sure to be flying high for months after. Let's go to Thailand! 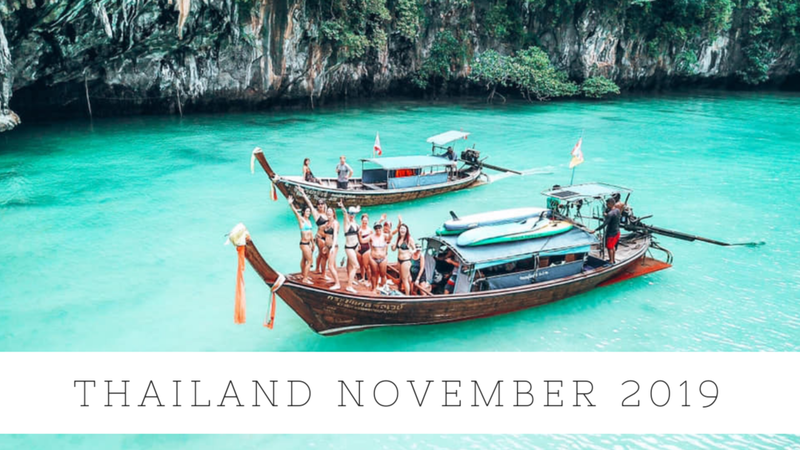 We have once again partnered with Adventure Travel experts, Flow Stand Up Paddle & World Travel to bring you a Thailand vacation unlike anything you have ever experienced. After returning from our first Adventure Vacation from Thailand, we knew we HAD to go back and continue to share all the magic the country has to offer. We have the experience and inside knowledge of the area to provide our guests an experience on par with everything we do at Wheelies and Waves. Check out this line up of endorphin educing activities below! Our accommodations are carefully selected to ensure you have your own little paradise to come home to after a full day of adventure. While each temporary home along our adventure has it's own unique character, they are all in the best locations with amazing views and very comfy rooms. Nearly all of them are on the beach or just feet from it. Morning coffee is served up with a view and you will always have a sanctuary to rest your head at night. Our exploration of Southern Thailand will include stays in Bangkok, Railay Beach and Koh Lanta. Each day is carefully planned to included plenty of time for blissful relaxation on bucket list beaches between thrilling adventures and tours. Just pack you bags and leave the planning to us! Thailand is an outdoor lovers paradise. In between boat rides to stunning locations, amazing dinners together at sunset and quiet mornings next to the ocean, our days are full of a large variety of wild adventures. Paddling in dreamy water is just the beginning. Here is a small taste of what the rest of your days will be filled with. Hong Islands Private Tour & BBQ- We will take a private chartered long tail boat for a full day tour of the Hong islands off the coast of Krabi. After exploring, swimming, snorkeling and paddling in hidden lagoons and beaches, our guides cook us a BBQ feast on the shores of another secret beach. It's amazing! Rock Climbing Railay Beach - Railay beach is down right beautiful and we will see parts of it only accessible through our special local connections. There are many options for various skill levels so the beginner can try your hand on a simple assent while the more adventurous can take on assents to top peaks sure to challenge any climber. After getting our feet under us and learning the basics we will hike into a cave and climb up to an overlook of iconic Railay Beach. Get your camera ready! What's next is about to be one of the coolest experiences of your life! For those not wanting to rock climb, Railay beach is a destination in itself and you can choose to relax, paddle and soak it up in any form you like. Or ...do it all! Private Chartered Boat Tour of Koh Rok - Toward the end of our adventure we will charter another private boat and take you to snorkeling dreamland ....Koh Rok. This full day experience is relaxing yet exhilarating. It's the perfect way to spend one of your last days in paradise! Stand Up Paddle Heaven - You know those iconic cliffs and emerald green waters you see all over the internet? WE WILL PADDLE THEM! We have two amazing tours planned for you that feature the best of Thailand. Ones that you will remember for a lifetime. All tours are friendly for ANY level of paddler. Heck we can even teach you how to paddle for the first time in Thailand!! Scooter Tours - When in Thailand you MUST do as the locals do and take a scooter for a spin. Riding scooters is the standard means of transportation in Thailand. In some places such as Bangkok it's pure madness. However in the right location it's pure fun and relaxing. During our visit to the low key island of Koh Lanta we will grab some scooters of our own and tour the best of the island including secluded cafes on the beach, stunning overlooks and remote beaches. Koh Lanta is the perfect place to take in a scooter ride as the traffic levels are minimal and views are amazing. Organized Yet Free - These planned activities are just the tip of the iceberg. You will have a chance to experience so much more of Thailand in non planned activities should you choose. Shop and eat at local markets, dine on the amazing street food, get a Thai massage on the beach, take a relaxing paddle on your own, hike a mountain for sunset or sunrise, try the local Thai coffee or breakfast porridge, participate in a beach clean up, take a yoga class, take a cooking class or catch a fire show. It's your vacation! Create the magic that best suits you! Thailand Adventure Vacation with CB SUP!!! We have partnered with Adventure Travel experts, Flow World Travel to bring you a Thailand vacation unlike anything you have experienced. They have been doing trips to Thailand for the last 4 years and have the experience and inside knowledge of the area to provide our guest an experience on par with everything we do at CB Stand Up Paddle. Check out this line up below! Our exploration of Southern Thailand will include stays in Bangkok, Railay Beach and Koh Lanta. We will see a lot and bounce around a lot stopping just long enough in each location to experience the best features of the area. You may not remember where we are going tomorrow or where we just came from but that is why you have us! We have all of the logistics planned out so you can spend more time with your feet in the sand and less time planning how to get there. We have also planned out our days so there is plenty of time for rest and relaxation between adventures and travel. The last few days of our trip will be spent in a blissful recovery state on quiet Koh Lanta giving you hours upon hours to stare at the ocean, nap in a hammock and fill your memory bank full of the beauty of Thailand. Thailand is an outdoor lovers paradise. In between boat rides to stunning locations, amazing dinners together at sunset and quiet mornings next to the ocean, our days are full of a large variety of wild adventures. Paddling in dreamy water is just the beginning. Here is a taste of what the rest of your days will be filled with. Private Chartered Boat Tour of Hong Islands- We will take a private chartered boat for a full day tour of the Hong islands off the coast of Krabi. After exploring, swimming, snorkeling and paddling in hidden lagoons and beaches, our guides cook us a BBQ feast on the shores of the last island just as the sun begins to set. It's amazing! Rock Climbing Railay Beach - Railay beach is down right beautiful and we will see parts of it only accessible through our special local connections. There are many options for various skill levels so the beginner can try your hand on a simple assent while the more adventurous can take on assents to top peaks sure to challenge any climber. After getting our feet under us and learning the basics we will hike into a cave and climb up to an overlook of iconic Railay Beach. Get your camera ready! What's next is about to be one of the coolest experiences of your life! See pictures below. For those not wanting to rock climb, Railay beach is a destination in itself and you can choose to relax, paddle and soak it up in any form you like. Or ...do it all! Scooter Tour - When in Thailand you MUST do as the locals do and take a scooter for a spin. Riding scooters is the standard means of transportation in Thailand. In some places such as Bangkok it's pure madness. However in the right location it's pure fun and relaxing. During our visit to the low key island of Koh Lanta we will grab some scooters of our own and tour the best of the island including secluded cafes on the beach, stunning overlooks and remote beaches. Koh Lanta is the perfect place to take in a scooter ride as the traffic levels are minimal and views are amazing. Organized Yet Free - These planned activities are just the tip of the iceberg. You will have a chance to experience so much more of Thailand. Shop and eat at local markets, dine on the amazing street food, get a Thai massage on the beach, take a relaxing paddle on your own, hike a mountain for sunset or sunrise, try the local Thai coffee or breakfast porridge, participate in a beach clean up, take a yoga class, take a cooking class or go full wild and experience the famous lady boy cabaret. It's your vacation! Create the magic that best suits you! Join us for an adventure filled day of stand-up paddleboarding, wine tasting, picnicing, and a beautiful drive over Kebler Pass as the aspens change colors for the fall! Emily will lead us through a gentle lunar practice and guided deep relaxation meditation intended to help you unwind and rejuvenate under the rising full moon. We’ve joined forces with KBUT and I Bar Ranch to bring you the biggest party of the summer! SUP Yoga is a unique and fun way to practice yoga, whether you're a beginner or wanting to take your practice to the next level! Kickstart your summer in 2018 by joining us on a trip to Nicaragua at Aqua Wellness Resort. Spend 6 days, 7 nights blissfully tapped into nature and yourself. Relax by the beach, enjoy the scenery, or join us on daily adventures including surfing, sup, motorcycle riding and private sunset boat tours. 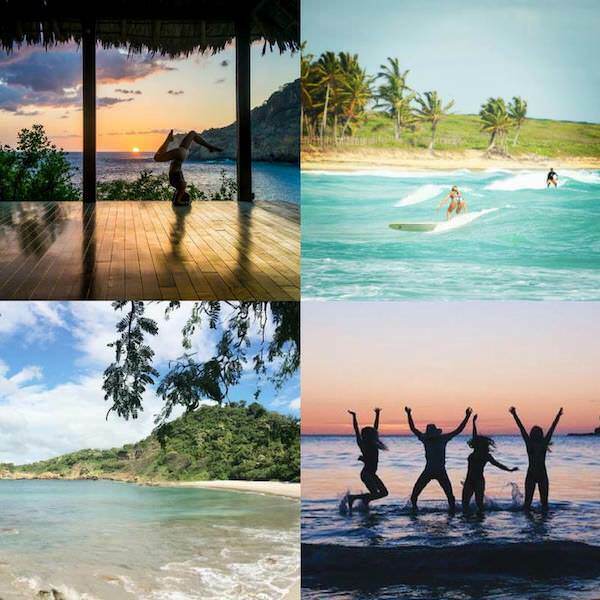 There's plenty to get excited about, including private pools, daily SUP tours on pristine waters, yoga, organic meals, lifestyle design with Courtney Burton and so much more. This is an incredible opportunity to invest in yourself, your wellness and your adventurous soul, among other people who are doing the same. Get back to reality by checking out with us in Nicaragua in spring 2018! Get more information here! Watch the Full Moon rise from your board while you practice yoga with Leia Morrison from Sanctuary Yoga in Gunnison on boards from CB SUP at Old Highway 50 Beach on the Blue Mesa. $55 includes yoga practice and all equipment, $25 if you have your own board or you want to join us in an outdoor practice on the beach.